This week I’m reflecting on some “big ideas” that struck me at the Orange Conference last week. Join the conversation . . . I’d love you hear your thoughts on these macroscopic ideas shaping our culture as we seek to minister to families. Kara Powell spoke during one of the general sessions on Friday about her book and research she’s done called Sticky Faith. The Fuller Institute set out to understand why nearly 50% of all students don’t return to church after they attend college. They followed hundreds of students through this transitional time in their lives and found that the one predictive factor to students with a thriving faith post-college was they had multigenerational relationships before leaving for college. She used some really stark language to describe what happens in the church with youth ministries. . . she framed the discussion as age segregation. After opening with the light story from the video above . . . a fun illustration about the “kids table and parents table” at family gatherings . . . she went straight for the jugular and described modern student ministries in terms of segregating young people. 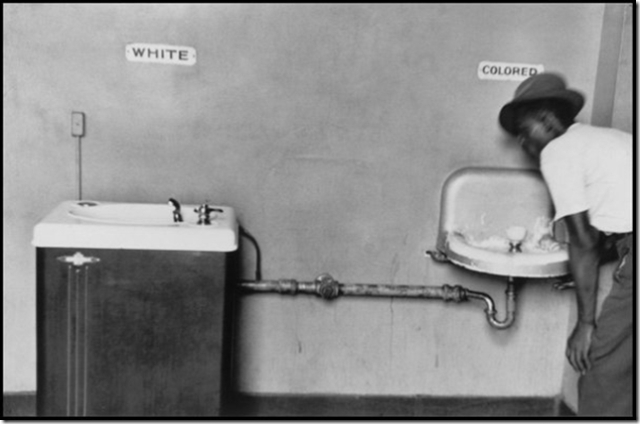 Behind her was a massive black and white photo of a “whites only” drinking fountain. When she said “segregation” she meant segregation. You could hear a pin drop in that room of over 5,000 people. This thought has been chewing away in my brain since last week. Have I been aiding and abetting a ministry type that is ultimately harmful to the spiritual development of students? What the study has found seems intuitively right . . . students need to experience a wide variety of backgrounds and ages to cement their faith. In my own life, it hasn’t been learning from my own peers that has driven my faith deep but from taking in experiences with people from a mixture of life experiences. What if we deliberately reframed student ministries to ensure that students got plugged into relationships with people from across the church? Should we stop running student ministries in time slots that take them out of the main service and integrate them into it? How can we encourage students to serve (and lead?) alongside people of all ages? I think that it is harder to be a child or youth today than ever before. For this reason I think that putting children and youth into environments that are designed for them and are addressing the unique issues that they face is very important. However, I can also see the value of putting children, students, and adults together. That being said, I don’t think that simply throwing children and youth into an adult service is the answer. I mean let’s face it, as much as the children’s and youth areas and services are designed for them, so are the adult services designed for adults. If we do nothing more than throw children and youth into a service clearly NOT designed with them in mind, then I think we run a new risk. I think that if we did this we could find ourselves in another 20 years or so looking back and saying that this is the reason that young people leave the church. At the end of the day I think that there are many reasons that young adults leave the church. In every situation I am convinced that it has less to do with the style of worship, the amount of time spent with different age groups or any of the other things. I firmly believe that this is results from a lack of a deep relationship with Christ. Perhaps rather than looking for the perfect formula for DOING church, maybe we need to focus on helping children and youth develop deep relationships with Christ. Let’s try that for a generation and see what happens. I think that some separate ministry times are important, so that key faith principles can be addressed in an age-appropriate way. But, gathering together and learning from people of different ages groups is important too. Serving alongside people of various age groups is very important too. Many youth experts are now saying that it is mentoring that should be central in youth ministry today….adults being mentors to young adults, young adults being mentors to teens etc. Mentoring is key for the spiritual development of youth and for the life of the church. When our daughters became teenagers, we told them to choose someone from the church to be their mentor… to have a mature Christ-follower to walk through their teen years with. They chose wonderful women who we are eternally grateful for their investment into our girl’s lives. Many years ago someone once told me that many young adults ditch their faith mostly because they never witnessed that faith or church made any difference in their parent’s lives. That really hit my husband and I!! We had to constantly ask ourselves whether our walk with Jesus was making a difference in how we lived our lives…were our lives an example of the transformative power of Jesus’ love and grace to our daughters at home and to the other youth we worked with in our ministry? Instead of putting ourselves on a guilt trip as parents, we took it as an exciting challenge to make it a goal to integrate our faith into day-to-day life, to talk abut stuff, to share failures, doubts, joys and to do compassion/mission opportunities together etc…. Youth and young adults need the opportunity to hang out with, and witness the transforming power of Jesus in adults’ lives both in the family and in the church. Providing times for youth and adults to swap life stories, to wrestle through stuff together, to practice transparency and vulnerability and to figure out how Jesus’ principles can be applied to real life is so important in our families and churches. As a youth pastor (and later as I oversaw children’s ministry) one of the foundations of our ministry is that all of our students would have a relationship with two (or more) adults that weren’t their parents. Typically these were their small group leaders, but we made it a priority to have a number of “at large” adult volunteers on hand to be available to our students, and develop relationships with them. As I have watched my students grow, I am excited to say that we are beating the national averages when it comes to kids sticking with their faith. I don’t say that to brag on me, I had some phenomenal teams working alongside me to make this stuff happen… they are the ones who really deserve the accolades on this one. As I process through all this, and what an ideal situation might be, were I serving in a church like Liquid, or some of the churches that I have serve at in the past, I believe I might encourage ministries to high school students be small group based… without a separate worship gathering. I still see a huge need for separate middle school ministry, but I think it is time to call our high schoolers to a higher standard, encouraging them to be a part of the church through worship and service. I totally agree. Although I started attending Liquid after my children were grown so it is not an issue for us, I do not agree with the family being separated from the time they walk in the door. I agree toddlers and elementary age children need an age-appropriate message but can’t we at least spend SOME time together in the service? All of culture is going this way too: media (TV/Web offerings) is very age-specific and is creating a polarization. Most TV evening shows can’t not be seen with young children in the room because of violence or sexual content so we send them to the other room with watch age-appropriate videos. We can’t do anything about the culture, but we (the church) don’t have to follow this trend. Children need not only to learn but to experience role models from adults who are not specifically catering to entertaining or teaching them. Plus I miss the presence of children among us. That’s why young folks are in the shape they are today. They’ve never been around self controlled Christian role models and they have parents who never grew up. Nowhere in the Bible are groups separated by age or gender. And there are always consequences when we try to fabricate a reality that is not in the Bible. In my opinion, age and gender segregation are work of satan. As a matter of fact, most of the time when the Bible talks about age, it is to break our stereotypes associated with it. For example, the stories of women becoming pregnant in old age.